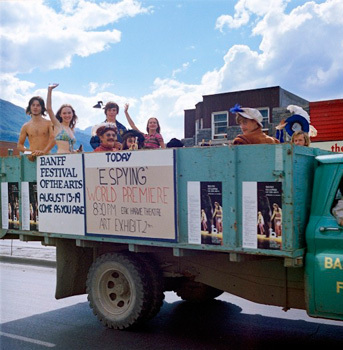 Banff Artist in Residence programs offer independent periods of study where artists, curators, and other arts professionals are free to experiment and explore. Participants are provided with an individual studio accessible 24 hours a day, as well as use of Visual Arts facilities including printmaking, papermaking, ceramics, sculpture, and photography. BAIR offers short and long-term opportunities to work at a remove from the constraints of everyday life. Doing impressions: What if we understood mimesis not so much in terms of representation, but literally, as a form of imitation, of mimicking, of doing impressions of nature? To draw a mountain is to mimic it, and, as a form of mimicry, a magical form of becoming. Mimesis, as a magical practice, is a question of technique: of molding your vowels, modulating the lines you draw or paint, adapting movements, as a means of activating the sympathetic relationship between you and what’s out there. The residency will be organized around regular field trips dedicated to plein air drawing, and close reading seminars in which to develop alternative intuitions of what mimesis could be. Three weeks, eight talks, and studio time. This residency will focus on time in the studio while also incorporating walks, conversation, studio visits, and readings as we contemplate the structure of experience. Such study is like hiking up a mountain. As one climbs and becomes aware of wider and wider vistas, it is important to not lose sight of details, at least not the critical ones. We must let go of some, however; life is too short. In addition to Visual Arts facilities access, Studio Time participants will be invited to attend the public lectures and meet the faculty and participants of the Banff Research in Culture (BRIC) residency, The Retreat: A Position of dOCUMENTA (13).